• Bruce Hollywood of Washington, D.C., a fellow in the White House Leadership Development Program and former deputy division chief for the Joint Operational War Plans Division. 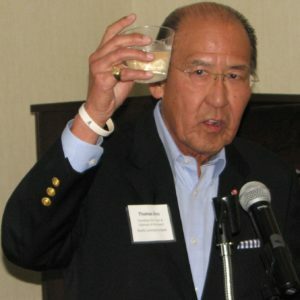 • Stan Masamitsu of Honolulu, president of Tony Group, a family-owned business of five automobile dealerships. 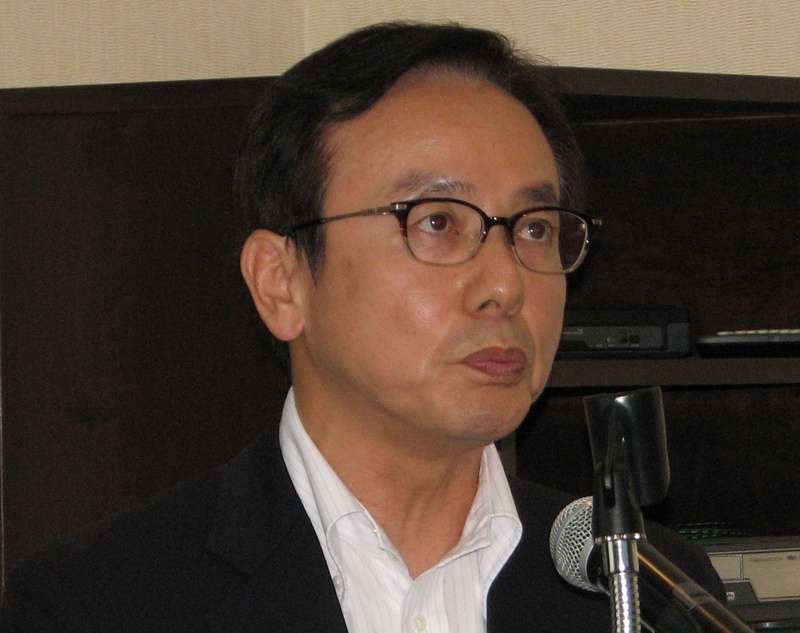 • Kiyo Matsumoto of Brooklyn, a federal judge of the U.S. District Court for the Eastern District of New York since 2008. • Monte Del Mar (Noda) Mesa of Tamuning, Guam, general manager of Guam Premier Outlets, who has worked with the Japan Association of Travel Agents to promote Japanese tourism in Guam. • Eric Nakajima of Amherst, Mass., director of the Massachusetts Broadband Initiative at the Massachusetts Technology Collaborative. • Darren Nakata of Portland, Ore., attorney-at-law with Perkins Coie LLP and secretary of the Executive Committee of the Japan-America Society of Oregon. • Mark Yokoyama of Alhambra, chief of the Alhambra Police Department and former police chief of Cypress. • Tasha Yorozu of San Francisco, managing attorney at Yorozu Law Group and board member of the Japanese Chamber of Commerce of Northern California. 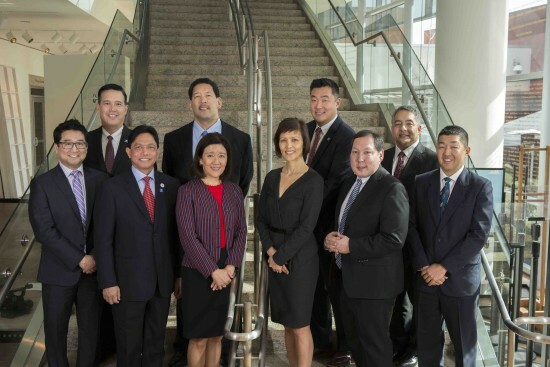 The purpose of the program, now in its 16th year, is to enable Japanese American leaders to engage with Japanese leaders in the business, government, academic, non-profit and cultural sectors, and to give Japanese leaders a greater understanding of multicultural America through the delegates’ stories. Sponsored by Japan’s Ministry of Foreign Affairs (MOFA) and administered by the U.S.-Japan Council (USJC), JALD began in 2000 and has sent 176 delegates to Japan. Upon their return, delegates work with their local consulates, community organizations and fellow JALD alumni to strengthen U.S.-Japan relations. A reception for the new delegates was held by the Japan Business Association of Southern California on Jan. 30 at the Miyako Hotel in Little Tokyo. Yuko Kaifu, JBA executive vice president and Japan House Los Angeles president, served as emcee. Hideo Miyake, JBA president and All Nippon Airways vice president and general manager, said, “JBA was established over half a century ago … Throughout our history, we’ve had good times and bad times. One thing we always remind ourselves of is that Japanese companies could not have prospered without the support of the Japanese American community. 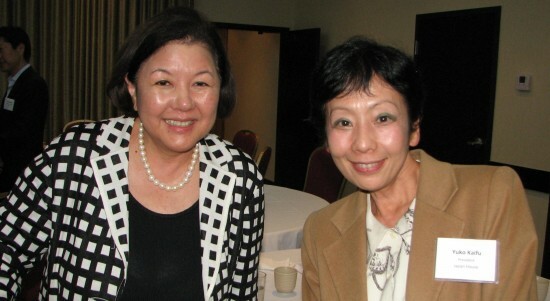 USJC President Irene Hirano Inouye and JBA Executive Vice President Yuko Kaifu. Kaifu reported that community leader Dr. Paul Terasaki, a pioneer in the field of human organ transplant technology, had passed away on Jan. 20 at the age of 86. “He was such a great scientist, a great philanthropist and more than anything else he was a very nice human being,” she said, asking everyone to stand up and observe a moment of silence. Consul General Harry Horinouchi, who was one of the orientation speakers, called on the delegates to “make harmonious friendships with Japanese people” during their trip. USJC President Irene Hirano Inouye, who has accompanied every delegation, explained the selection process: “There are 16 consulates in the U.S. There are 10 delegates, so … not every consulate gets to have a delegate. The various consuls general submit their recommendations. The USJC has a screening committee … We take into account experience as well as various professions, gender and who we think would make a great group of people, because it’s very much not only individuals but how we think the group as a whole will represent the various interests and backgrounds of the Japanese American community. Thomas Iino, USJC founding chairman. The USJC was also represented by Kaz Maniwa, senior vice president, and Allison Murata, program specialist. 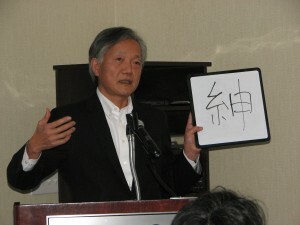 Mark Yokoyama, the lone delegate from Southern California, will be visiting Japan for the first time. He describe the trip as “a great opportunity to interact, engage, network, develop relationships and friendships” with people in both countries who are interested in U.S.-Japan relations. “Japan is a great ally, a great friend of the United States internationally, so what a great way … for me to participate in that relationship on a much bigger level,” he said. Kiyo Matsumoto, the federal judge from New York, said, “I am interested in connecting with our ancestral homeland. My grandparents came here … I haven’t been (to Japan) since 1978. I feel like I’m going for the first time because it’s changed so much in the last few decades, so I’m very excited about that. Over the years, Matsumoto got caught up in career and family, but through her involvement in the Japanese American Association of New York, she heard about JALD and applied. Since she was not selected last year, she said it was “thrilling” to finally be part of the program. For biographies of the delegates, click here.